When I started blogging at the beginning of the month, I mentioned that we are empty nesters now. Even though it has been a few months, I think I am still adjusting to the whole thing of having just Mike and me in the house. The biggest change has been the cooking or more to the point the baking. Since we have one less person to eat the baked goods, I am not baking as much as did before our son Adam moved out. Mike and I definitely don’t need to eat all the sugary goodies even though I would love to. So I have stopped baking like I did before and when I do bake it is smaller portions. This is one of my desserts that work well for just the two of us. About a couple of weeks ago my sister was talking about a yummy peach cheesecake that she had made for her family. It sounded delicious, but I really don’t need a whole cheesecake sitting in my kitchen. That is when I put on my thinking cap. How about a no-bake cheesecake for two? Or maybe a cheesecake base with no crust, just the creamy cheesecake and peaches topped with a sweetened whipped cream. 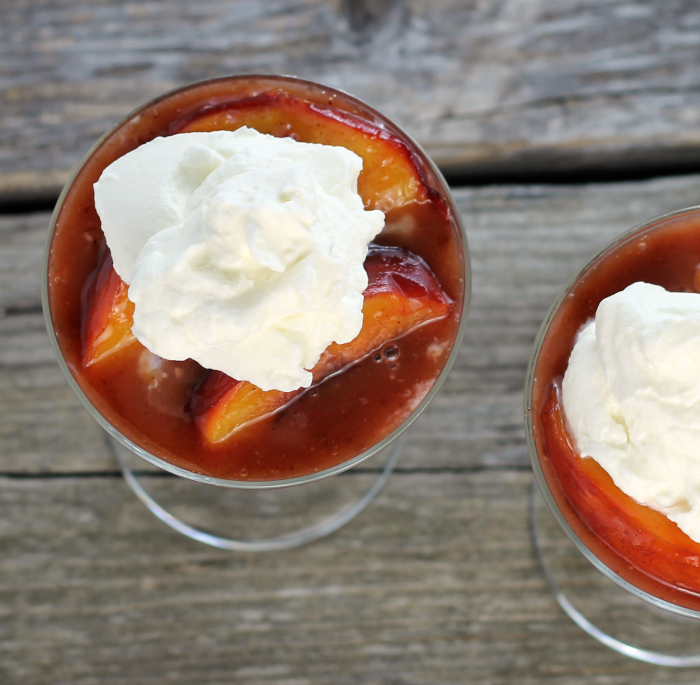 This is what this post is all about… peach cream cheese dessert. Believe when I say this is simple but totally yummy!! The cheesecake part of the dessert contains cream cheese, sugar, whipped cream, and vanilla. Simple! The peaches are sauteed in a skillet with butter, brown sugar, and cinnamon. Simple! 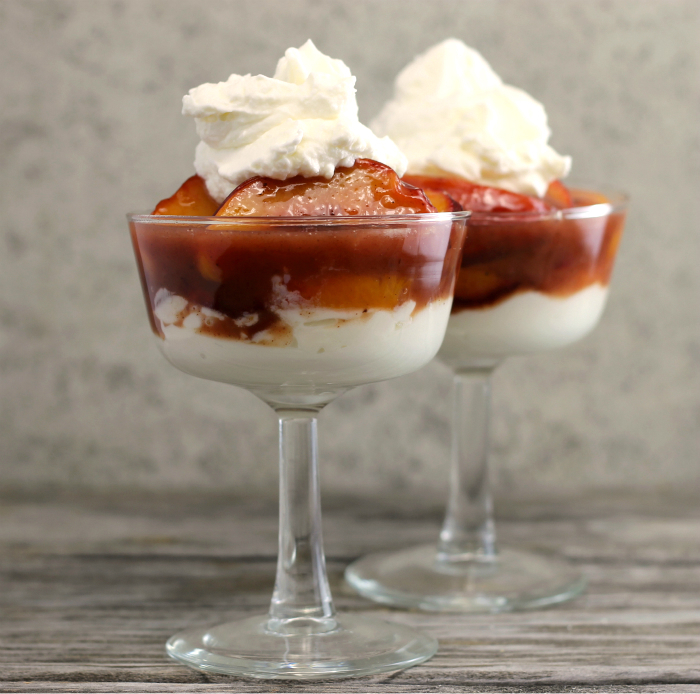 The two combinations are then layered in a dish and topped with a sweetened whip cream. You have scrumptious dessert in less than a half an hour. Perfect! Don’t need a dessert for you? You can double the recipe or triple it if you need to. But, don’t wait too long to make this peach cream cheese dessert, peaches won’t be in season forever. Slice peaches into thin to medium slices. Add the butter and brown sugar to a skillet melt over medium heat. Once the butter is melted add the sliced peaches. 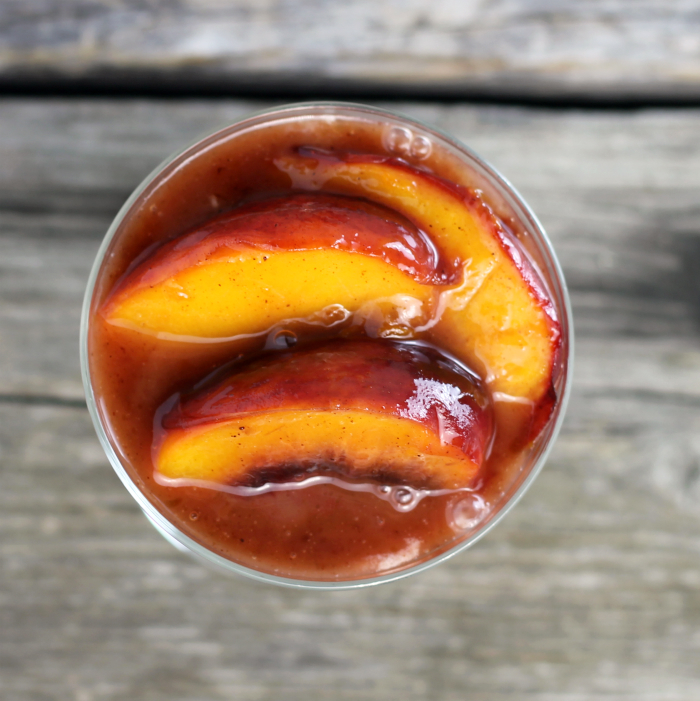 Saute for 2 to 3 minutes or until the peaches are soft and the butter and brown sugar have thickened slightly. In a medium bowl beat the cream cheese and powdered sugar until light ant fluffy. Add the vanilla and beat in. Add the whipped cream and fold into the cream cheese mixture. Spoon the cheesecake mixture into two glass dessert cups. Top with the cooled peaches. (It is ok if they are slightly warm). This looks really nice and it doesn’t seem too complicate to make. I should make a batch before the peach season is over. Yum on the peaches. I’m fixin’ to get some this week for hand-pies. This is right up my alley—for more than one reason!! I adore peaches, first of all, and without the boys living here, a dessert lasts for weeks!!! Nick was home for the summer and that boy can eat. I’m now having to readjust my recipes or we eat the same thing for day after day. This is one amazing dessert! 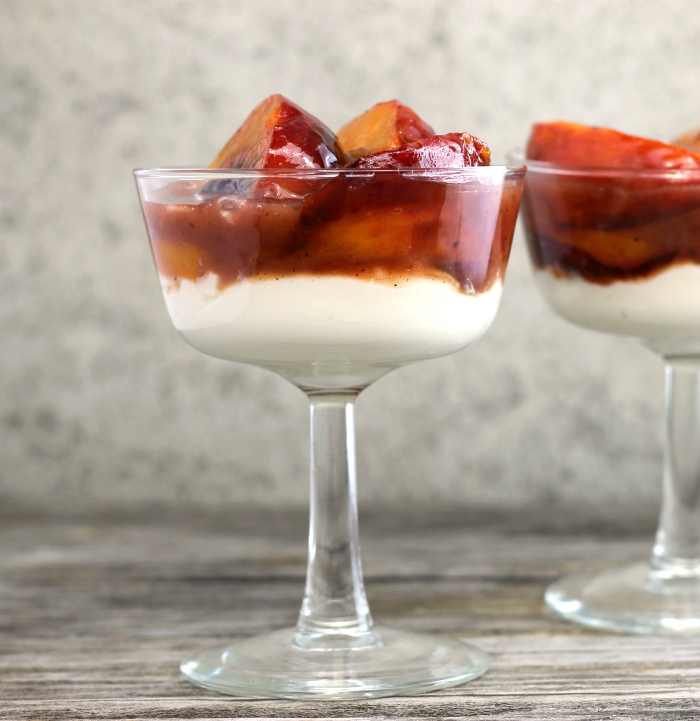 Peaches and cheesecake in a dessert sounds so luscious! Whenever I make a whole cheesecake it never gets eaten, this would be perfect for my husband and I!